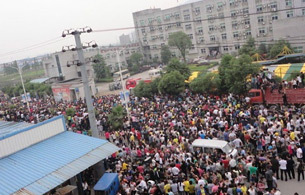 Summary and links to news stories of workers' struggles around East Asia during May 2012 and related resources. The most important stories appear on my Twitter feed as soon as I find them: http://twitter.com/spartacusnews. This month there has been news from Burma/Myanmar, Cambodia, China, East Timor, Indonesia, Japan, Malaysia, Philippines, South Korea, Taiwan, Thailand, and Vietnam. For pages that are not in English, you may want to use a translation service such as Google Translate to get an idea of what the article is about. Regarding the Hi-Mo factory strike in Myanmar, there's a video available online of the workers (nearly all female), who have barricaded the owner in his office, shouting down the government official sent to deal with the strike. The owner and managers can be seen at 1:22 minutes into the video locked inside the office. One point: I've noticed some articles (such as this and this on the protests against electricity cuts in Burma/Myanmar) are from Radio Free Asia, which as best I can tell is funded by, and supports the line and goals of, the US govt. Which in all honesty does make me think twice about some of the articles in question. That said, I've really appreciated having this blog to hand as a way of being aware of struggles we'd otherwise know nothing about. Yes, I suppose I should make it clear that pretty much none of these sources are written from a libertarian communist, or even vaguely 'objective' perspective. Most are the local equivalents of national media in the West, and of the apparently more progressive, most are either trots or as you say, funded by various governments (even the invaluable China Labour Bulletin is I believe), so should be read with this in mind. I intend these posts mainly as an overview or murky glimpse to inspire further research in what is happening in Asia, not a definitive guide. Hopefully others (or even myself) with more time can dig deeper and find other more reliable sources (I'm always open to suggestions, though preferably ones with RSS feeds). And if nothing else, I'm glad it makes people aware of the struggles occurring, and goes someway towards dispelling the myth of the passive, poor hard working Asian proletariat awaiting liberation from the West/Maoists/Lady Gaga (delete as appropriate). I think that this is a great service and we won't, at this stage anyway, be getting any "pure" working class information through. I used the China Labour Bulletin - a supporter of "Free Trade Unions" - extensively for a recent article for the ICC.